Firstly, it is important to acknowledge that these products are only really going to cause an issue as far as the 'preliminary test' is concerned, i.e., the hand-held breathalyzer administered by a police officer (the 'blowing' machine used in all states and/or the 'talking' machine, currently only used in NSW and the ACT). None of these products should cause problems with the 'evidentiary test', i.e., the more accurate test that counts, with those results being used in court. Apart from 'ambient air', it is 'alcohol debris' that is likely to be the issue and because the second test is conducted some time after the first (there should be at least a 15 minute wait between the two), natural saliva production should have washed that debris away and won't be picked up. Mouthwash: This seemed to be the one most likely to get young men into trouble, possibly because there was the belief that gargling with mouthwash could actually prevent you from failing an RBT if you had been drinking. In reality, some brands contain very high levels of alcohol (some over 25% alcohol content) and keeping a bottle in your car to swig back should you be pulled over is just plain dumb. You can now buy 'alcohol-free' mouthwash and I certainly recommend all young drivers use this whenever they can. The problem with mouthwash is that if you do have good dental hygiene practices and gargle, it is more likely that you do so just before you go out (few people gargle and sit and watch TV). 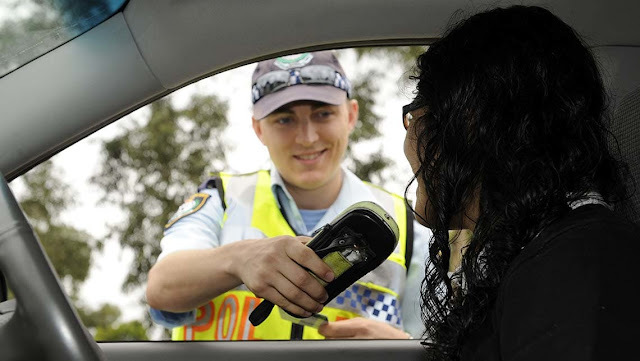 If you do gargle, get into your car and then get pulled over by police and breathalyzed in the minutes after leaving your home there is a chance that you could get a positive reading due to 'debris' of alcohol in your mouth. 'Ambient air': This is a really interesting one and most probably the most likely reason given to young people by police as to why they may have failed a test. Ambient air basically means the smell of alcohol in the car and can cause a problem if the driver has had alcohol spilt over them (particularly their right shoulder near where the test is conducted) or have had a bottle smash or spill in the car (a number of young people have told me that they have had bottles or cans of alcohol explode in their vehicle and subsequently fail an RBT). Now I would imagine the smell would have to be pretty out there and obvious but it's a possibility. But it's not alcohol that you drink that is most likely to cause problems here, it's the alcohol that you wear - perfume and after-shave. I've spoken to many police who say that this is often the reason why they believe a young driver blows over 0.00, with the smell being pretty overpowering as the window is wound down. Interestingly, I met a teacher last year who blew over 0.05 on her way to school on the day of my visit, apparently due to the fact that when she was pulled over and waiting for the officer she sprayed perfume on herself. After assuring him that she hadn't been drinking, she was tested again a couple of minutes later and blew 0.00! Foods containing alcohol: It's more likely to be cakes and desserts that cause problems here, foods with alcohol 'soaked' into them, e.g., tiramasu, sherry trifle and one of the worst offenders, Christmas pudding. If you're an L or a P plater and you get a small amount of the brandy-soaked dessert stuck between your teeth, it is possible to fail that preliminary test (apparently an episode of RBT highlighted this problem with a young driver failing her preliminary test due to having just eaten tiramisu). Some young people ask whether pastas in wine sauces and the like can cause a similar problem and the answer is most probably 'no'. According to people I have spoken to, when the alcohol is used in cooking and heated, you get the taste of alcohol but you lose the alcohol content - it's the soaking that could cause a problem. Although no-one usually tells young drivers that this can happen, the strong smell of alcohol in the car or on their person could possibly cause a positive test. It's important to note that this is much more likely when the 'talking' machine is used, where the breathalyzer could potentially 'scoop up' the ambient air. If you're driving and you can smell alcohol in your vehicle or on your passengers, or there is an overpowering stench of perfume and/or after shave wafting around, all you have to do is wind the windows down for a few minutes. get that smell moving - it won't take long at all to clear the air. Young drivers should also be aware that there are some foods and liquids that can cause an elevated reading in the minutes after they are consumed, but that is why there is a break between the preliminary and evidentiary tests. The best way for an L or P plater to avoid an embarrassing moment and failing an RBT due to something they've eaten is to ensure they always rinse out their mouth before driving. Have a bottle of water in the car and before you put the key into the ignition, take a mouthful, swill it around and then spit it out - do this and that'll most likely remove any debris that may be there and prevent an unpleasant and unnecessary visit to the 'booze bus' or the local police station.